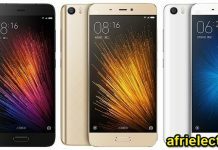 Xiaomi Redmi Note 5A announced in November 2017 and it became available in the same month, the Android smartphone comes with a display of 5.5-inch touchscreen, and with a resolution of 1280×720 pixels. The smartphone has a PPI density of approximately ~267 PPI density. Xiaomi Redmi Note 5A Android smartphone powered by Octa-core ARM Cortex A53 Qualcomm Snapdragon 435. It packs 4GB RAM and 64GB internal storage, and it is expandable up to 128 GB (dedicated slot) through microSD card slot. The Android smartphone packs 16 megapixels Back Camera and 13 Megapixels Front Camera. The Android smartphone is a dual SIM Dual SIM (Micro-SIM, dual stand-by) device and packs with FM Radio. Xiaomi Redmi Note 5A powered by non-removable Li-Ion 3080 mAh battery and runs MIUI 9.0 Android OS, v7.0 (Nougat). The dimension is 153×76.2×7.7 mm (6.02×3.00×0.30 in) (height x width x thickness), and the weighs 153g. It packs 5.5-inch touchscreen display with a resolution of 1280×720 pixels, and the thickness is 7.7mm. Xiaomi Redmi Note 5A sensors include Fingerprint (rear-mounted), accelerometer, gyro, proximity, compass, barometer, light sensor. The connectivity includes GPS, MicroUSB, 3G, 4G, Bluetooth, and Wi-Fi. Hey, I do think this is an excellent website. I stumbled upon it. I am going to return once again since I have saved it as a favorite website. I am looking for such an informative post for a long time. Thank you for this post.Thank you for sharing your expertise. This post is very helpful. It’s informative too! This is very informative website that have a large information about smart phone. Dual sim smartphones are not good they hangup a lot. There is a big thing of putting sim in which slot. One can put a specific sim in slot 1 and not in slot 2. If you put it in slot 2 they will not work. Great post ! thanks for sharing .. Informative article! Thanks for sharing such an amazing article! Really nice mobile with good features..
nice smartphone and features of this phone. This phone is very economical to buy and is at the top in the protection and features. This is great work. Keep posting such informative blogs. You are really making a difference. This Piece of device provide enough to to the user. Hi,your great work every sell phone information in here,thanks for sharing.